The Heat ran out of steam in the fourth quarter on Thursday, losing the period by 16 points on the way to an 87-111 drubbing in San Antonio. The loss squandered a bounce-back effort from Chris Bosh, who scored five points on Tuesday but led Miami with 24 points on 10-of-16 shooting vs. the Spurs, while adding seven rebounds and two steals. Bosh is averaging just 28 minutes in March but that may actually be a good thing -- he's probably the least likely of Miami's key veterans to pick up precautionary DNPs during the busy finale to the regular season (see schedule grid). That favorable schedule is worth remembering if you own Mario Chalmers, who scored only five points on 2-of-7 shooting with two rebounds, three assists and four turnovers. The subtle upside is that he also had one 3-pointer, two steals and one block to salvage some fantasy appeal, the kind of numbers which have given him late-round value over the past dozen games. Dwyane Wade's owners may not be as pleased about all of Miami's four-game weeks. He scored 17 points on Thursday and continues to produce whenever he's on the court, but a few precautionary DNPs seem inevitable with four back-to-back sets looming in March (9/10, 18/19, 21/22, and 28/29). With a bit of luck his DNPs will be spaced out enough to allow him at least three games in each remaining week of the regular season. LeBron James suggested that Miami's sleeved jerseys may have contributed to his 6-of-18 shooting night vs. the Spurs, and he reminded reporters that he shot 0-of-7 from beyond the arc while wearing sleeves during the All-Star game. I'd be very curious to see aggregated numbers of team/player FG percentages while wearing sleeves vs. traditional jerseys, especially if the numbers were in some way weighted to account for opponents, home vs. away, and days of rest. My guess is that no difference would be found, but who knows? It's just as likely that the problem is psychological. If LeBron is even peripherally aware of extra fabric brushing, bunching or clinging to his shoulders or arms during his shooting motion, who's to say it's not a competitive disadvantage in a game where the opponents' limbs are unencumbered? We're talking about a four-time MVP and a guy who just last week dropped 61 points with a protective mask, so it's not as though he's inventing excuses to explain a single sub-par shooting night. Manu Ginobili also said on Thursday that the new sleeved jerseys will take a while to adjust to, adding that he wears his one size bigger to allow for extra room. Just something to keep in mind. There were no other real surprises for Miami. Greg Oden went scoreless in six minutes during his return from a precautionary one-game absence, Michael Beasley chipped in 11 points and six rebounds with a steal and a block in 21 minutes, and with Wade active it was a quiet night for Ray Allen (six points, five assists). Gregg Popovich once again tweaked his lineups to perfection, starting Boris Diaw (16 points, eight rebounds, five assists) over usual starting center Tiago Splitter (seven points, two rebounds in 19 minutes). Diaw has been surprisingly good against LeBron James defensively in the past, thanks to his size and nimbleness, and Thursday was no exception. He also made 5-of-5 field goals, including a pair of 3-pointers, and he's now made 12 straight shots over the past two games. He belongs in active fantasy lineups even if he does head back to the bench for Saturday's game vs. the Magic. Tim Duncan led all Spurs scorers with 23 points on 9-of-13 FGs and 5-of-5 FTs, 11 rebounds, two assists and one block in 33 minutes, while Tony Parker added 17 points and four assists. Both Kawhi Leonard and Danny Green salvaged their evenings with some defensive stats, while Patty Mills racked up nine points, 10 rebounds and four assists in just 17 minutes off the bench. Veterans Marco Belinelli and Manu Ginobili combined for 14 points and seven assists in limited playing time and it's probably unwise to rely on the Spurs' reserves while Popovich has so many options at his disposal (he used a balanced nine-man rotation on Thursday). Oklahoma City blew a 16-point lead late in the third quarter as their defense decomposed and their offense devolved into a stagnant procession of long jumpers. Astoundingly, OKC's fourth quarter featured exactly one shot at the rim, one pair of free throws, four mid-range jumpers, and 14 shots from 20 feet or beyond (including a whopping 10 attempts from downtown). They made of few of their long jumpers, which may have been fool's gold, and the lack of offensive discipline has to be concerning for Thunder fans. OKC's loss of late-game composure also squandered another hyper-efficient line from Russell Westbrook -- he finished with 36 points on 13-of-22 shooting, four 3-pointers, nine boards, nine assists and four steals. He played just 30 minutes, coming painfully close to recording two straight triple-doubles in a total of 50 minutes playing time (he had 13/10/14 in 20 minutes against (who else?) the Sixers on Tuesday). Westbrook has faced two of the league's worst defenses, which helps, but his court awareness, physicality and improved shooting range have been on full display. He told reporters after Tuesday's game, "I never go in looking to shoot first, pass first, rebound first. I just come in and play off instincts." Meanwhile, Kevin Durant scored a relatively "quiet" 34 points with three 3-pointers, seven rebounds, five assists, four turnovers, and zero steals or blocks. He played a game-high 44 minutes and regardless of your feelings about the league's MVP race this season, Durant's fantasy-MVP credentials are already engraved on the 2013-14 trophy. Serge Ibaka added 18 efficient points, five rebounds, one steal and three blocks, but starters Steven Adams and Perry Jones III were both scoreless with zero assists, steals or blocks in just 11 minutes apiece. Jones III should be ignored in typical fantasy leagues and he may soon lose the starting SG job to Caron Butler, who led OKC's reserves with 14 points, four 3-pointers and one assist in 29 minutes. Butler seems like the guy to own in the wake of Thabo Sefolosha's strained calf -- he may not provide much beyond points, 3-pointers, a handful of rebounds and an occasional steal, but that's better production than we're seeing from Jones III or Jeremy Lamb (seven points in 13 minutes). Reggie Jackson has been a solid option over the past month but he flopped on Thursday (four points, three assists in 18 minutes) and his playing time has dwindled in the past four games from 34 minutes to 27, 25 and 18. The Thunder play three games in each of the next two weeks, which leaves little margin for error, so keep a close eye on Jackson's role during Sunday's game at L.A. (just keep in mind his numbers will likely be inflated vs. the Lakers). The Suns' offense continues to amaze and they rode it to a crucial 126-120 win vs. the visiting Thunder on Thursday, led by Gerald Green's career-high 41 points. Green was scoreless after one quarter but he simply couldn't miss in the second and third periods, finishing 12-of-22 from the field, 8-of-13 from downtown and 9-of-11 at the FT line (it's worth mentioning that the Suns were wearing sleeved jerseys). Goran Dragic scored 22 points and handed out four assists but he saved his best for last, making a series of tough buckets late in the fourth quarter to maintain the Suns' precarious lead. The Morris Bros. continue to be one of the most dynamic bench duos in the NBA -- Markieff Morris scored 24 points, Marcus Morris had 15 points, and the twins combined for 13-of-20 shooting with nine rebounds and five assists. Starting SF P.J. Tucker spent most of his energy trying to make life difficult for Kevin Durant, but he piled up a typically understated line with seven points, one 3-pointer, nine rebounds, four assists and two steals in a team-high 43 minutes. The only clear disappointment was starting C Alex Len, who scored six points and grabbed three rebounds but also committed five personal fouls in 11 minutes of action. Given the fast pace of this game, OKC's lack of a true center and the Suns' tendency to run small anyway, it's unwise to trust Len even with Miles Plumlee (knee) on the sidelines. Needless to say, there weren’t many meaningful things to take away from this game. Every Clippers starter double-doubled with the exception of Darren Collison, who scored 24 points with four rebounds, three assists and one steal. Even the second unit had a field day – Glen Davis scored 10 points in 19 minutes, Danny Granger scored 10 points, Hedo Turkoglu had nine points, eight rebounds and some defensive stats, rookie Reggie Bullock notched 11 points with three 3-pointers, and even Willie Green had nine points, six rebounds and a gaudy +/- rating of +28. None of the reserves I just mentioned should be relied upon in standard leagues, including Granger. The Lakers’ side of the ledger included a dud from Wes Johnson, who had two points on 1-of-9 shooting, with four steals in 30 minutes. Fellow starters Kendall Marshall and Jodie Meeks scored seven points each, on a combined 6-of-19 shooting, and the only players to somewhat escape the slaughter were Pau Gasol (team-high 21 points), Kent Bazemore (14 points, six assists) and Xavier Henry (15 points, three 3-pointers, five rebounds, three assists and one steals. Henry did his damage in just 19 minutes and his value will be unsustainable unless his playing time increases – if it does it would likely come at the expense of guys like Bazemore, Johnson and Meeks, and as usual the Lakers’ rotations need to be monitored closely. The Lakers play only two games this upcoming week, so in most cases owners will have to look elsewhere for short-term value. The Clippers’ high-scoring 1998 game I mentioned earlier was played in L.A. vs. the Raptors on March 13. The Clips' scoring was led by starters Lamond Murray (25 points), Rodney Rogers (24), Darrick Martin (21) and Eric Piatowski (18 points), as well as reserves Maurice Taylor (18) and Lorenzen Wright (16). That distinguished crew torched a Raptors starting lineup of rookie Chauncey Billups, Doug Christie, John Wallace, Reggie Slater and Oliver Miller, with a second unit led by Shawn Respert, Dee Brown, and 18-year-old rookie Tracy McGrady. I wrote that for nostalgia's sake, but also to point out just how awesome the new NBA.com/stats site has become – in addition to viewing the boxscore for the above-mentioned game, you can see shot-charts for both teams as well as individual players. They haven't yet archived video of individual plays as they have for the 2013-14 season (for instance, click here to watch all of LeBron's 61 points), but that’s coming eventually. I want to recognize a few players who are dominating the competition on the eve of most fantasy playoffs, beginning with Ty Lawson. The Nuggets' PG is tearing it up in two games since his return from a fractured rib, averaging 25.5 points, 2.5 triples, 5.0 rebounds, 9.0 assists and 3.0 steals, with phenomenal percentages from the field (57.1 percent) and FT line (87.5 percent). I thought he might favor his ribs somewhat upon his return, and any decline in his shifty-quick moves would have had a deleterious impact on his game, but those fears have proved to be unfounded. The Nuggets play four games in each of the next two weeks and they don't have any two-game duds on the schedule, so Lawson is balling at just the right time for his playoff-bound fantasy owners. 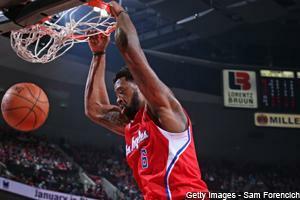 We constantly tout Kawhi Leonard's sneaky fantasy appeal at Rotoworld, and the latest example is his four-game stretch upon returning from a fractured hand. With averages of 15.3 points, 2.0 threes, 6.5 boards, 2.3 assists, 2.5 steals, 2.0 blocks, 60 percent FGs and 100 percent FTs, nobody but Ty Lawson has returned more value on a per-game basis over the past two weeks. He racked up 11 points, one 3-pointer, five rebounds and five steals vs. the Heat on Thursday, and before the game Gregg Popovich said he wanted Kawhi to be more aggressive than he has been lately, so he should continue to mint his own fantasy currency. Matt Barnes has been a must-start player with both J.J. Redick (bulging disc) and Jamal Crawford (calf) out of commission. He's racking up 17.3 points, 3.3 triples, 5.2 rebounds, 2.3 assists, 1.0 steals and 0.7 blocks, with phenomenal percentages. He had 17 more points on Thursday with 12 rebounds, five assists and three steals, getting an additional boost with Jared Dudley sidelined by back spasms. Barnes is hot enough that he should remain a go-to option even when Dudley and Crawford get back on the court. Isaiah Thomas continues to casually pile up elite fantasy PG numbers, and his consistency is making it almost routine when he notches 23 points, a pair of 3-pointers, three boards, seven assists and two steals in a game. Those numbers are his actual averages over the Kings' past seven games, so the appeal is self-explanatory. When fantasy drafts roll around next fall, don't lose sight of IT2's season-long fantasy bonanza in 2013-14. In an uncanny reminder of last season, Deron Williams has bounced back nicely from injuries after the All-Star break. His two-week averages of 17.4 points, 1.1 threes, 5.4 assists and 2.7 steals are good enough on their own, but he's combining it with a microscopic 1.4 turnovers per game to temporarily boost his nine-cat value into the top-15. Even if his numbers level off down the stretch his fantasy owners will have to be satisfied, given the lousy trajectory he was on before mid-February. Mavericks veteran Vince Carter continues to log just 25 minutes per game off the bench, yet he's been tremendously efficient over the past dozen games with averages of 14.5 points, 2.4 threes, 4.2 boards, 2.7 assists and 1.2 steals. The perimeter shooting is the prime driver of his fantasy appeal, and his FG percentage is often a drag, but he's turning the ball over a mere 0.8 times per game during this recent stretch and is a must-start player in nine-cat leagues until he cools off. Patient fantasy owners who hung onto Tobias Harris this season are being richly rewarded over Orlando's past half-dozen games, as he's averaging 19.3 points, 5.9 rebounds, 1.1 steals and shooting well from all over the court. He even dropped a career-high 31 points on March 2 (albeit against the 76ers) and the lottery-bound Magic should give him all the minutes he can handle down the stretch. The only drag here is that Orlando has a poor fantasy playoff schedule with just one four-game slate in the final six weeks of the season. Ramon Sessions is shooting 30.8 percent from downtown this year, nearly mirroring his career average, but he's sneakily gone 8-of-14 from beyond the arc since Feb. 1. The veteran hasn't missed a beat since being traded to Milwaukee, where he's averaging 12.5 points per game, and the Bucks' upcoming five-game week makes this an ideal time to plug Sessions into fantasy lineups if you need a cheap source of assists and FT percentage, with a trickle of points and the occasional 3-pointer. Next week's Friday Dose will take a somewhat unorthodox form, as I plan to gauge players' expected values (daily or weekly) based upon their recent production, opponents' performance vs. specific positions, and possibly other factors including home vs. away and days of rest. Some of the more ambitious elements may have to wait until the offseason, when I'll have more time to tinker with spreadsheets and work out the kinks, but it will at least be of interest to those readers who enjoy my more stats-centric columns and spreadsheets. I tried to make an in-depth spreadsheet last night, but ultimately scrapped it after two hours because a few small errors early in the process made the final analysis inaccurate. It was frustrating, but at least I know where I went wrong. Check back next week to see what I come up with. In the meantime, don't forget that Rotoworld's Season Pass already includes a powerful and customizable rankings engine which is immensely helpful when setting your lineups and making the tough decisions which make or break fantasy teams. I will continue to update my rest-of-season schedule every Friday to help you intelligently and opportunistically scour the waiver wire or, where eligible, make a late-season trade. For instance, you can see at a glance that the Heat are the only team with 22 games remaining on the schedule, while there are seven teams with only 18 games remaining -- the Cavaliers, Mavericks, Warriors, Clippers (including a pair of two-game duds), Lakers, Knicks and Magic.